Day one of the 2017 International Stamp Exhibition proved to be one of the busiest mornings I’ve seen at a trade show in quite some time. From the moment, the doors opened hordes of enthusiasts flocked to the Australia Post pop up shop to secure their Day One souvenir products. Once everyone began to settle into the show we found that quite a few attendees were very keen to have their collections appraised and some were quite surprised with just how much their little old bread tin filled with old coins was truly worth! Downies Numismatist, Steve Kirby was run off his feet with a fantastic array of old and new coins being consigned for our upcoming July Auction. The Gilded 1932 Penny which celebrates the 85th Anniversary of Downies Coins was another unexpected pleasant surprise for our customers who made a purchase today. The only way to secure one of these beautiful coins is by making a purchase at one of the upcoming trade shows. These coins will not be available anywhere else so make sure you drop in and say hello! Celebrating the centenary of Australia’s first stamps... HUGE 24-carat gold stamps! 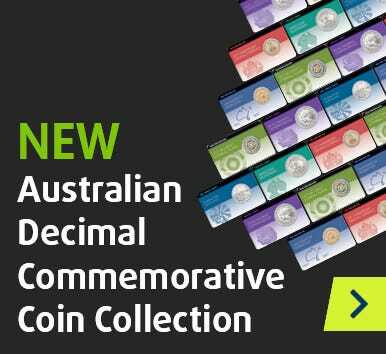 Comprising genuine, original examples of Australia's first two stamp types, this remarkably affordable presentation forms a wonderful way to celebrate the 100th anniversary of the launch of Australia's first national philatelic system. Although unity was achieved at Federation in 1901, it took more than a decade for the Commonwealth Government to launch Australia's first national postage stamps – the Kangaroo & Map 1d and the George V Portrait 1d. Offered in highly collectable Fine Used condition, and presented within an attractive, informative pack, the chance to add these historically crucial types to your collection for just A$14.95 must not be missed! A strong statement of national sovereignty, and a crucial juncture in the history of the young nation, Australia's first stamp was released on 2 January 1913 – and instantly sparked huge controversy. Although Australia's new Constitution gave the Commonwealth control over 'postal, telegraphic, telephonic, and other like services' at Federation in 1901, it was not until 1911 that priority was given to the creation of Australia's first stamp. It was in that year that the Postmaster-General's Department launched a Stamp Design Competition, with the winning design featuring a facing portrait of George V.
Members of the ruling Labour Government were opposed to the King's portrait being used on Australian stamps, however, with Charles Frazer, the Postmaster-General, believing that every letter leaving Australia should bear an 'advertisement of the country on its stamp'. As Frazer believed that a stamp picturing the British monarch did not represent the new nation, he favoured a stamp uniting a kangaroo and a map of Australia. Highlighting the extremely political nature of the controversy, the new conservative government, upon election in June 1913, commissioned a new series of stamps to replace the Kangaroo stamp, with the George V Portrait 1d released in December 1913. Ironically, considering the stormy debate surrounding the creation of Australia's first two stamp types, the Kangaroo & Map series and the George V Portrait series would co-exist for the best part of a quarter of a century! Australia’s first stamps in pure GOLD! A lavish, prestigious tribute to the 100th anniversary of Australia's First national philatelic series, launched in 1913, this breathtaking presentation comprises massive versions of the nation's first stamps – crafted from pure 24-carat GOLD! Perfect recreations of these historic 100-year-old stamps, the 1913 Kangaroo & Map 1d and 1913 George V Portrait 1d look absolutely sensational when crafted from the world's favourite precious metal. Measuring 75mm x 58mm, and therefore much, much larger than the original stamps, this glittering golden duo is superbly presented within a solid acrylic stand – ideal to display your prestigious new acquisition. Perfect for the home or office, and excellent collector value at A$175, each 24-carat gold stamp set is accompanied by examples of the original stamps – valued at A$14.95 but yours for FREE! Comprises recreations of Australia's first two stamps – crafted from 24-carat gold! Includes FREE original examples of Australia's first two stamps – valued at A$14.95!
. . . and get the original stamps for FREE! Buy the sensational 24-carat gold stamps above, and receive the 'First Australian Stamps Pack' – valued at A$14.95, but yours for FREE!